Chairman Smith, at right, listens to the riveting testimony of the witnesses. From the left are Reps. Mark Meadows (NC-11), Robert Pittenger (NC-09) and a committee aide. 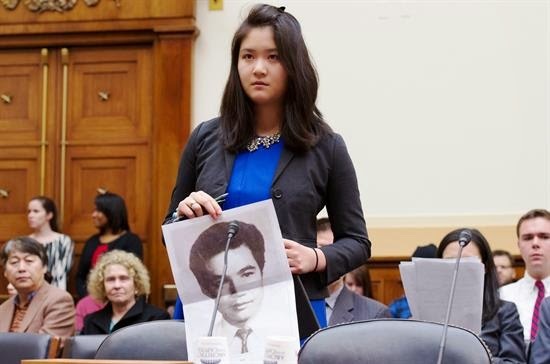 Bridgette Chen, daughter of Liu Xianbing, holds her father's image. Lisa Peng, holds a picture of her father, political prisoner Peng Ming. Danielle Wang, holds a picture of her father, Wang Zhiwen, an engineer at the P.R.C. Ministry of Railways, persecuted as a practitioner of Falun Gong. Reporters watch as the witnesses plead for Vice President Joe Biden to speak out on behalf of their imprisoned fathers. 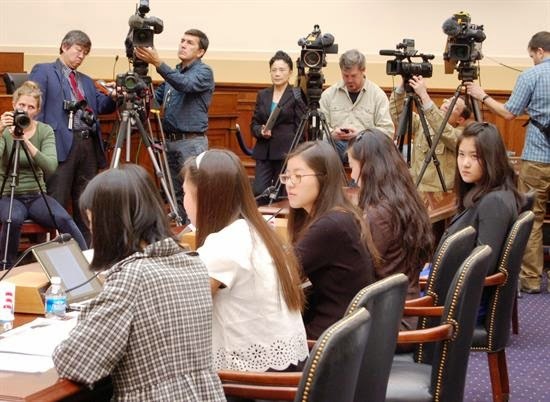 Reporters listen to the testimony of the daughters of imprisoned men in China. Grace "GeGe" Gao, daughter of Gao Zhisheng, and Ti-Anna Wang, daughter of Wang Bingzhang, display photos of their imprisoned fathers. Former Chinese political prisoner and world renown human rights leader Chen Guangcheng attended the hearing with his brother. Chen's nephew is also imprisoned. 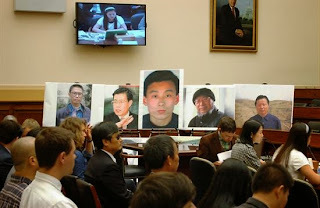 Posters of jailed activists were on display at the public hearing. 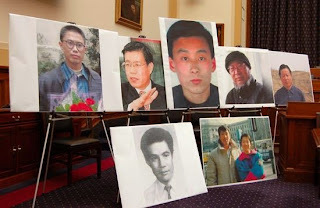 Posters of prisoners of conscience held unjustly by the Chinese government. 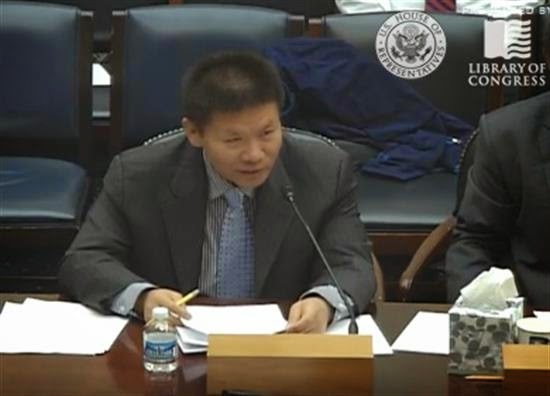 Pastor Bob Fu of ChinaAid testifies before the House panel. Chen Guangfu, in the U.S. from China for the hearing, and father of imprisoned Chen Kegui. 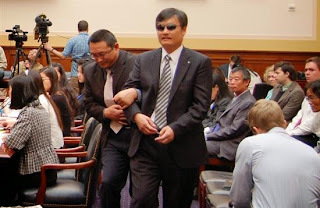 The witness is the brother of renowned blind human rights lawyer Chen Guangcheng. 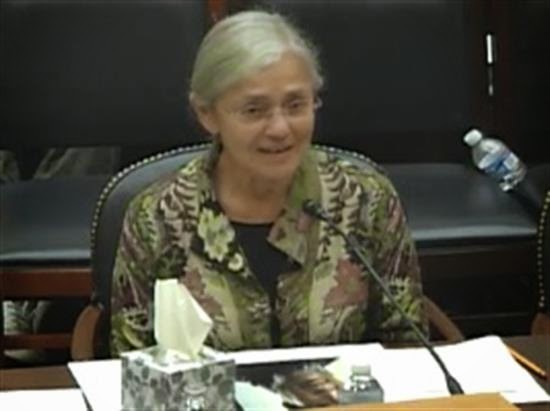 Dr. Devra Marcus, a physician and activist, addresses the House global human rights panel. Amid powerful and often emotional testimony, five young women appealed to Vice President Joe Biden, who is now in China, to bring their unjustly-imprisoned fathers' plights to the attention of the Chinese government, and seek their release. 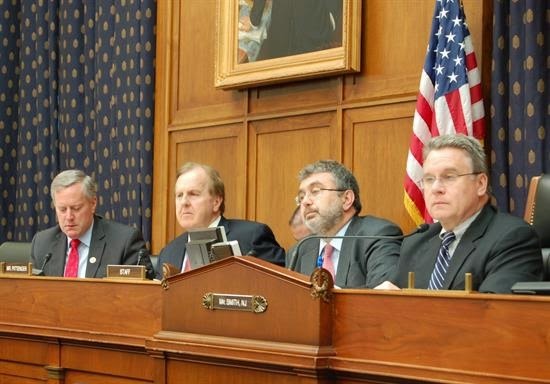 They spoke passionately at a hearing held by U.S. Rep. Chris Smith (NJ-04), senior member of the House Foreign Affairs Committee and chair of its subcommittee on global human rights. 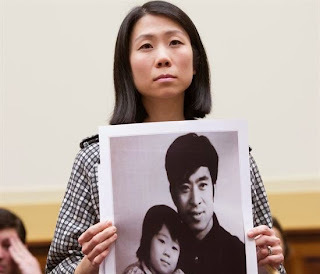 "I join with my fellow sisters here today to request Vice President Biden to ask Chinese leaders to release our fathers, and to request an Oval Office meeting with President Obama to share our stories," said Lisa Peng, daughter of Peng Ming. "I know that my dream to be reunited with my father and my father's dream for his country can come true with your support, persistence, and affirmation of the universal and fundamental values of our country: freedom, democracy, and justice." As a second child to her parents, she dodged the nation's brutal one-child policy, which forces women to undergo abortions against their will for such reasons as failing to have a birth permit, being an unwed mother-to-be or being a second child. "Because I was a survivor of the one-child forced abortion policy I was considered a non-entity, couldn't go to school and even when my mom would drive my brother to school and I was in the car, the government would have four secret police tailgate us and bump into us as we were driving to school," Peng told the panel. "There was no future for me in China. The fact that I safely escaped and was accepted by the United States, and respected in classrooms, and my voice was heard in classrooms, and I have opportunities—unimaginable opportunities—to do whatever I want in the future and to give back to the community that has given me so much—that's what makes me feel so grateful and hopeful every day." Peng, who came to the U.S. in 2001 as a political refugees with her father, an environmentalist, an economist, author and a human rights activist, said he was lured by eight Chinese secret police to the border of Thailand and Burma and kidnapped in 2004. After nearly 10 years in prison suffering heart attacks, arthritis, malnutrition, and kidney stones with no medical care, her father perseveres and remains hopeful. "The Chinese government today is in the business of breaking minds, bodies and hearts," said Smith. "When China bullies, incarcerates, tortures—and even executes—a prisoner of conscience, their entire family and friends suffer an excruciating sense of loss, bewilderment, emotional pain and agony. Often members of the family are themselves subjected to interrogation, mistreatment and house arrest in order to amplify the hurt. In a very real sense, everyone close to a prisoner of conscience goes to jail and lives a seemingly unending nightmare. Every day, family and friends are left to wonder what terrible abuse awaits dad or mom or a brother or sister or child. Every day, the tears flow. Click here to read Chairman Smith's opening remarks, made at a hearing entitled, "Their Daughters Appeal to Beijing: 'Let Our Fathers Go!'" 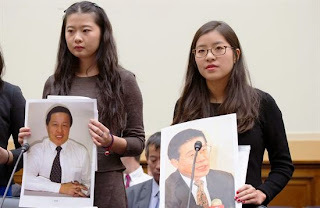 Testifying were Lisa Peng, daughter of Peng Ming; Grace "GeGe" Geng, daughter of Gao Zhisheng; Ti-Anna Wang, daughter of Wang Bingzhang; Bridgette Chen, daughter of Liu Xianming, and; Danielle Wang, daughter of Wang Zhiwen. 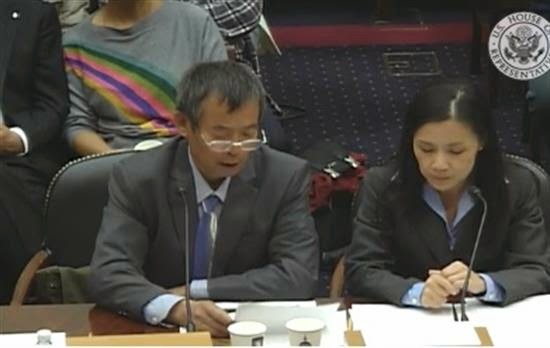 Also testifying were Bob Fu, Founder and President, ChinaAid Association; Chen Guangfu, in the U.S. from China for the hearing, the brother of blind human rights lawyer Chen Guangcheng and father of Chen Kegui, and; Devra Marcus, M.D., physician and activist. Click here to read summary of witness biographies. 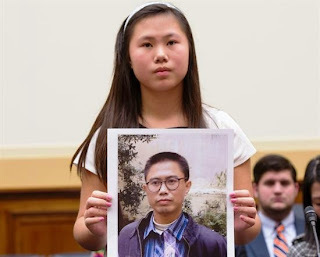 Grace "GeGe" Gao, daughter of human rights attorney Gao Zhisheng said she was grateful she has for the past five years been living in the country with the most freedom in the world, but still feels pain in her heart because of her father's imprisonment. "Freedom has not yet come to my dad, so it still has not genuinely arrived for me and my whole family," said Grace Gao. "I wish that President Obama and Vice President Biden could mention about my father's name Gao Zhisheng in public occasions and urge the immediate release of my father without conditions. I wish that staffs from US Embassy in China could go to visit my father in the prison. It has been almost a year now that no family or lawyer visit was allowed to see my father." Gao said policemen took her to school every day, and went in and sat behind her in the classroom. They even went in the restroom with her and did not let her close the door. Her three-year-old brother was escorted to the kindergarten in the police car as well, and his classroom was the only kindergarten room with a surveillance camera. Gao said she wished people in the world could write postcards to her father. Though he could not see what they say, but the Chinese communist regime "will hear our voice." The "concern and care for my father is the greatest protection over him." 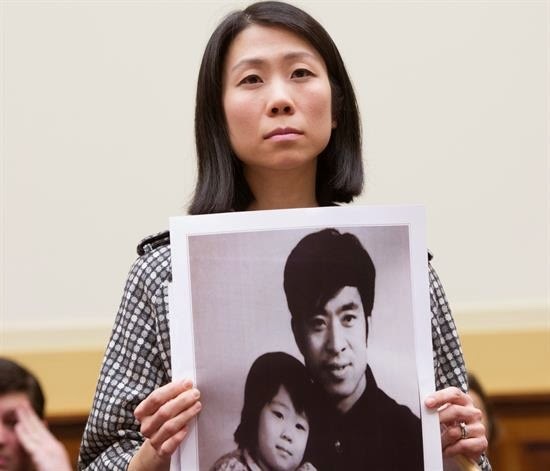 Bridgette Liu recalled the plight of her father, Liu Xian Bin, as a daughter and a witness, and asked the Vice President Joe Biden to help. "My father has been in prison three times which totals up to 14 years because of his political views," said Bridgette Liu, noting that when he was temporarily released from prison in 2008, it was so hard for him to believe that she had already grown up. He was again taken away from her life by the policemen in 2010. 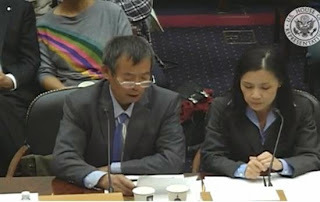 Liu told the congressional panel, at one point invoking the spirtit of Thomas Jefferson and the Declaration of Independence: "I sincerely ask the U.S. Government, Mr. Biden, and the President to [have] more concern of the families of prisoners of conscience and help us to free our fathers! And I ask for an Oval office meeting with President Obama for a more direct and detailed conversation in order to reunite our families." Ti-Anna Wang, born in 1989 and named after the Tiananmen Square democracy movement and massacre, called attention to the plight of her father, Dr. Wang Bingzhang a political prisoner currently serving a life sentence and in solitary confinement in China. Her father is a New York-based permanent U.S. resident and a prisoner in the 11th year of a life sentence for his prodemocracy activism. He was kidnapped in Vietnam and forced back into China where he was taken into custody by Chinese police and convicted in a sham trial. "I unabashedly ask the leaders of the US government, including President Obama, Vice-President Biden, Secretary of State Kerry, and Ambassador Powers to seize all diplomatic opportunities with China to seek the release of our fathers," TiAnna Wang said. "I believe high-level diplomacy is our fathers' best chance for freedom, and their releases must be discussed on occasions such as Vice-President Biden's recent trip to Beijing. 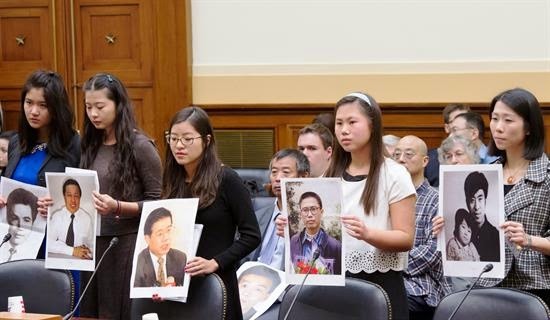 "I ask the Obama administration to meet with the five of us and listen to our first hand experiences as witnesses of China's human rights abuse," Ti-Anna Wang said. "I want our stories and our efforts to be heard, acknowledged, and taken into serious consideration when the US devises its foreign policy." 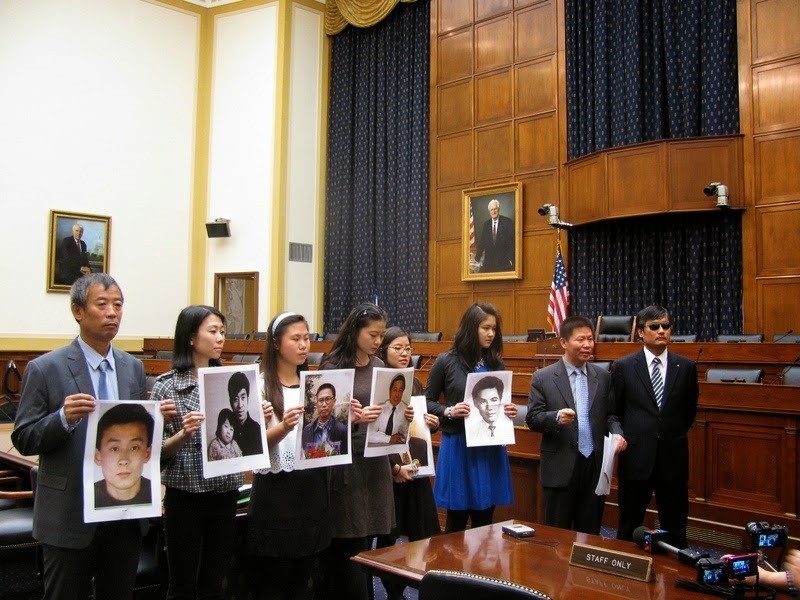 "Here in the United States, many families are getting ready to gather for Christmas and New Year's," said Danielle Wang, whose father Zhiwen Wang is one of the millions of Falun Dafa practitioners in China under persecution by the Chinese government. "In China, we would be starting to look forward to Chinese New Year. But this time of year is always bittersweet for me, because of the painful absence in my family since my father's summary arrest and detention in July of 1999. "A lot happens in 15 years," Danielle Wang said. "Being away from Dad and growing up without him has been so hard. I hope that the decisions I've made in my life would make him proud. At my wedding we placed a single rose on his chair to symbolize his presence and celebrate his place in my life. I continue to keep that rose safe and present until the day we meet again and I can hand it to him and tell him the story of how he has always been with me." Click here to read all the witnesses' statements. "Far too many of us who live in freedom often fail to exert ourselves in a meaningful way to assist prisoners of conscience and their loved ones—in China and elsewhere," Smith said, co-chair of the U.S. Congressional-Executive Commission on China. "Far too many of us fail to empathize with their plight. Or to see what's just below the façade of the purported harmonious society. The repression is systematic, pervasive, unrelenting and unnecessary—the people of China love their nation and deserve better treatment." 虽然苏联时期的官方史学声称那时出现了"无产阶级的苏维埃"和"资产阶级的临时政府""两个政权并存"的状态，然而实际上，二月革命以后相当 长的时期内，布尔什维克不仅并未在苏维埃中占优势，也没有主张"一切权力归苏维埃"，而只是强烈指责临时政府拖延召开立宪会议。甚至在他们控制了 彼得格勒苏维埃并据以发动推翻临时政府的十月革命时，虽然提出了"一切权力归苏维埃"的口号，也只不过是把它作为革命措施，而并未宣布苏维埃是永 久性政府。相反，当时苏维埃代表大会通过的决议明确宣布："工人和农民的临时政府在立宪会议召开之前掌握国家政权"。他们继续指责临时政府终于宣 布的立宪会议选举日期是靠不住的，宣称只有苏维埃才能保证立宪会议选举如期举行。在十月革命前两周，列宁指示布尔什维克控制的军队要给士兵放假， 以便组织他们回乡进行"关于立宪会议的鼓动工作"，争取农民选票以便"在立宪会议中获得多数"。在十月革命前夜，布尔什维克的机关报《工人之路》 以通栏标题向人民发出号召："把惟一彻底的和坚忍不拔的革命党——布尔什维克选进立宪会议！"
纵观列宁从1905年到1917年使用"君主立宪制"（монархическаяконституция）、"立宪君主制" （конституционнаямонархия）、"民主立宪制"（демократическаяконституция）、革命立宪等概 念的排序上就可以看出他的思想变化。把立宪制放在词尾是为了强调"立宪"，用立宪作形容词是为了强调"君主制"。"君主立宪"与"立宪君主"是同 一制度的两种叫法，意思相同但侧重点不同：立宪君主制，是把它看作君主制的一种，与其他的君主制并列在一起；君主立宪是把它看作立宪制的一种，是 同民主立宪制并列在一起。1905年革命时他对"君主立宪"还是比较称赞的，认为这是资产阶级民主革命的重要内容，"俄国掀起的立宪运动，当代人 还没有看到过类似的当前这样的政治活跃局面"，"专制制度不可能和这个阶级保持和平，以立法形式直接反映统治阶级的利益是必要的"，"无产阶级应 当支持资产阶级的立宪运动"，"无产阶级的地位使它成为彻底的民主主义者"，"资产阶级革命对无产阶级是极其有利的"。在这个过程中列宁还专门把 "自由派"与"反动派"区分出来。孟什维克认为"召集立宪会议是革命的彻底胜利"，十月革命当中，列宁多次说："自由派资产阶级及其政党力图使革 命半途而废，把君主制保留下来，由君主即旧政府来召集立宪会议，实现君主立宪制。无产阶级及其政党则力求把革命进行到底，彻底废除君主制，由临时 革命政府来召集立宪会议，实现民主立宪制，即民主共和国。"
这一天，主要由孟什维克组成的（联合）俄国社会民主工党中央委员会发表《致全俄公民书》，这个以"全世界无产者联合起来"开头、以"社会主义 万岁"结尾的声明指出："立宪会议被以武力驱散了……甚至早在中央执行委员会打算做出解散立宪会议的决定之前，立宪会议就已经被解散了。布尔什维 克一如既往，首先用武力解散了立宪会议，随后便关闭了塔夫利达宫不让任何一位立宪会议成员进入。只是在这以后，才要求中央执行委员会公布关于解散 的命令。因为自布尔什维克党夺取政权以来，苏维埃的全部作用归结为在'人民委员会'的决定上盖上一个印章。没有任何'苏维埃政权'，有的只是布尔 什维克党（中央）委员会的政权，以及追随他们的那些武装队伍的政权。"
与这份传单类似，沙皇时代素来同情布尔什维克的左派作家高尔基，也在这一天激愤地写下了《1月9日与1月5日》一文，严厉谴责布尔什维克。他 把当天发生的惨案比之为点燃1905年革命烈火的沙皇屠杀和平请愿工人的"流血星期日"：布尔什维克的"来复枪驱散了近百年来俄国最优秀分子为之 奋斗的梦想"。罗莎·卢森堡说，"列宁和托洛茨基曾经强烈地要求召开立宪会议"，而十月革命后的立宪会议选举又"是根据世界上最民主的选举"， "在完全自由的条件下进行的第一次人民投票"，布尔什维克却"毫无敬畏之念，干脆宣布投票结果毫无价值"，是"逆历史潮流而动"的行为。考茨基 说："苏维埃组织优于普选，在于它更加专断，它可以把一切它看着不顺眼的组织排除在外"。"我们的布尔什维克同志把一切都押在欧洲普遍发生革命这 张牌上，因为这张牌没有拿到手，他们就感到不得不依靠行使赤裸裸的权力，即实行专政来代替他们所缺乏的条件。"